Paramedics work long and demanding shifts that may place them in dangerous situations, potentially jeopardizing their personal safety or the safety of their patients. In fact, paramedics are about three times more likely to experience mental or physical injury in the workplace than other professionals in healthcare-related industries (1,2). While the potential for emergency medical services (EMS) personnel injury is significant and well-documented, paramedics likely also face other more inconspicuous biohazard risks that arise from patients, visited sites and the variety of unsanitary conditions they experience while performing their duties. Pathogens are disease-causing microorganisms that cause an estimated 220,000 healthcare associated infections (HAIs) each year in Canada, with approximately 8,000 HAIs leading to patient death (3). The frequency of HAI by antibiotic resistant bacteria may also be rising as evidenced by a 1,000% increase in documented methicillin-resistant Staphylococcus aureus (MRSA) HAIs in Canadian hospitals from 1995 to 2009 (4). With these facts in mind, the need to identify potential biohazards in the EMS workplace is intuitive, especially considering that paramedics routinely treat injured or immunocompromised patients that are at increased risk to HAIs. Surprisingly though, very little is known about this topic. Meanwhile, at the University of Lethbridge, Dr. Hans-Joachim Wieden, a professor of biochemistry and Alberta Innovates Strategic Chair in Bioengineering was exploring the use of biosensors and DNA sequencing technologies as tools for detecting and identifying small molecules and microorganisms. After receiving the request for assistance from LFES, Dr. Wieden and his research team immediately responded. The collaboration was natural and has provided LFES with the first dedicated resources to address the need for pathogen risk assessment and identification of best cleaning practices. On the other hand, Dr. Wieden and his research team had the opportunity to apply their developed technologies to address a very real and immediate need. Beginning in the summer of 2016, Dr. Wieden and his research team in collaboration with LFES began developing the first framework for pathogen detection and monitoring in the EMS sector using cutting-edge DNA sequencing technology. The science behind identifying pathogens is based on the fact that all living organisms (including pathogens) store their genetic information in the form of DNA. After collection of samples from ambulance vehicles or equipment, pathogen DNA can be extracted, amplified, read and identified by the presence of specific DNA signatures in a manner similar to human fingerprinting identification (5). The DNA sequencing approach is also much more rapid than traditional pathogen detection techniques (<8 hours versus >48 hours) (6), and can detect a much greater diversity of pathogens in the same test (5). Dr. Wieden’s research group is also piloting a relatively inexpensive and portable DNA sequencer, that may eventually enable paramedics to perform their own DNA sampling and sequencing in the future. Dr. Wieden’s research team has now obtained samples from several LFES ambulance vehicles and they are currently performing DNA sequencing and analysis using their developed techniques. Although results are still forthcoming, findings from the study are expected to be published in an EMS-related scientific journal within the next few months and will detail information such as the types of pathogens found in ambulance vehicles, which locations are most likely to host pathogens as well as the impact of day-to-day and monthly cleaning procedures on pathogen load. After completion of their initial study, LFES and Dr. Wieden are eager to continue pursuing the questions of pathogen prevalence and best cleaning practices in EMS by obtaining additional grant funding and increasing the number of sampling sites within Alberta and across Canada. The ultimate goal for this initiative will be to create robust tools for pathogen identification and monitoring that may be employed by EMS personnel in the workplace. Pathogen data gathered from DNA sequencing from ambulance vehicles could be used to identify emergent pathogen risks (or epidemics), while monitoring of pathogen levels over time could provide valuable insights into the efficacy of cleaning products or the development of resistance. All of these will ultimately result in decreased biohazard risk to EMS personnel, their patients, as well as their families and the general public. Moreover, the developed technologies will be immediately transferrable to help identify pathogen biohazards in many other unregulated areas (e.g. hospital emergency rooms) within both public and private sectors. 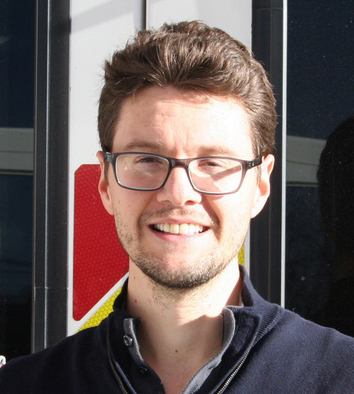 Andy Hudson is a Postdoctoral Researcher working with Dr. Hans-Joachim Wieden at the Alberta RNA Research and Training Institute (ARRTI) at the University of Lethbridge. Andy’s research is focused on developing novel biosensors that may be used for a variety of purposes, including pathogen detection. Andy is also a collaborator with LFES to develop pathogen detection and monitoring tools using DNA sequencing. Maguire BJ, Smith S. Injuries and fatalities among emergency medical technicians and paramedics in the United States. Prehosp Disaster Med. 2013;28(4):376–82. Maguire BJ, O’Meara PF, Brightwell RF, O’Neill BJ, Fitzgerald GJ. Occupational injury risk among Australian paramedics: an analysis of national data. Med J Aust. 2014;200(8):477–80. Zoutman DE, Ford BD, Bryce E, Gourdeau M, Hébert G. The state of infection surveillance and control in Canadian acute care hospitals. Am J Infect Control. 2003;266–73. Public Health Agency of Canada. Results of the Surveillance of Methicillin Resistant Staphylococcus aureus From 1995 To 2009 A Project of the Canadian Nosocomial Infection Surveillance Program ( CNISP ). 2011. Turner DJ, Dai X, Mayes S, Juul S. Complete assembly of novel environmental bacterial genomes by MinIONTM sequencing. bioRxiv. 2015;26930. Greninger AL, Naccache SN, Federman S, Yu G, Mbala P, Bres V, et al. Rapid metagenomic identification of viral pathogens in clinical samples by real-time nanopore sequencing analysis. Genome Med. Genome Medicine; 2015;7(1):99.